The Bureau of Information was formed as a consequence of collating votes for the Constitution. Originally a branch of the Research Centre for Multiple Identities, the workload and expertise developed is such that a stand alone research unit has been created. The Bureau is available for statistical form and questionnaire writing, collation of statistical information and creating data summaries for organisations across the public and private sector. Other outputs of the Bureau include Created Identities: hybrid culture and the internet Convergence 2005 Volume 11 Number 4 p44-59. London, Thousand Oaks and New Delhi: Sage Publications. The bureau is prearing data visualisations for the exhibition Silicon chips are made of sand at Wanganui UCOL in March 2006. 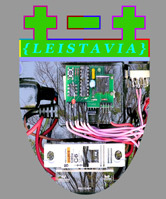 The Research Centre for Multiple Identities is centrally funded by Leistavian ideology to explore multiplicity in identity. The Centre co-ordinates projects that assists, identifies and authenticates multiple identities. Projects that the Centre co-ordinates fall into four main categories: hybrid identities, multiple identities, the multiple identities database and authenticating identities. The Centre is always interested to hear of proposals for projects. Hybrid identities can be made of diverse parts, based on contingency and circumstances as they arise. If the Centre visits your local town or city, local and online participants are brought together, with everyone profiling themselves and their other selves. When the collated data is turned into statistics, a hybrid local-Leistavian personality profile can be generated. Characteristics of the local community, in terms of default personalities and nominated personalities, can also be summarised and profiled. The idea that the self is a singular entity is only one concept of self. Clearly for those who believe in reincarnation, there can be more than one sense of self. In times of oppression, people will mask an identity in order to prevent their freedom being restrained - a political activist might obscure true intentions in order to achieve a greater goal. In former times, people who were gay often felt they had hide their sexuality, in order to progress in their job for example. However, this is the 21st century and in many places times have changed. It is no longer necessary to hide such things. The Research Centre for Multiple Identities invites people to celebrate the differing sense of themselves in positive ways. Bring out the alternate you. Name your other self. Have two birthdays a year, or more. Be you, and the other you as well. Are you perhaps tired of the stress of just one personality with all those conflicting pressures and requirements? Burdened by expectations of your age, gender, sexuality or ethnicity? The Centre for Multiple Identities is here to help with the load, by giving you a space to be free, to explore, to just have a good time dreaming and roaming personal space. The Multiple Identities Database gathers information about multiple identities cohabiting within one. Marcel Duchamp had Rose Selavy; Andy Warhol was aka Drella. In the South Pacific nation New Zealand Aotearoa, a one person collective of artists known as et al and and consisting of merit groting, blanche readymade, p mule, minerva betts and others, recently won a prestigious award and exhibited at the Venice Biennale. You are invited to email information about people with multiple personalities especially where these are named or formally identified by images. On account of privacy and related issues, the Centre reserves the right to monitor submitted information and if there is a complaint about data held in the register, it may be withdrawn. Currently the Centre is in an information gathering phase. Most data located to date falls into the following broad categories - multiple artist identities, the changing of immigrant names at cultural borders, the creation of imaginary and fictional societies, the adoption of other language names by students studying abroad and psychotic multiple identities. The data will be released when an appropriate context is located. A major activity of the centre is authentication of hybrid and multiple identities through the issue of birth certificates and ID cards. These can usually only be issued within the context of a local exhibition occurring at the same time as internet based participation.